I will start this review with a kind “Spoiler Alert.” To really give an honest review of what I like or dislike requires a few spoilers. You have been warned. 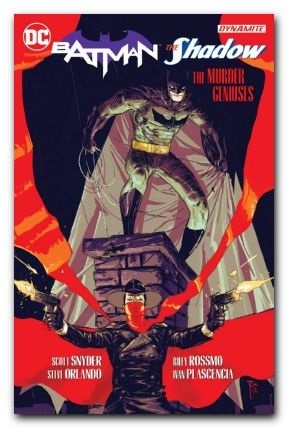 Batman and the Shadow combine forces to stop a man the Shadow has killed over and over again. The Shadow believes the man to be immortal. Batman has his own ideas, including whether or not the Shadow is on the side of justice! I am of mixed feelings about this book. On the plus side, it stars two of my favorite heroes—Batman and the Shadow. Two unmovable fighters for justice joined together to fight a man who always declares “I am an honest signal!” should make a really great story. But there are speed bumps on the road to this adventure. Originally he was the host and narrator of the Detective Story Hour. He also ran in his own magazine for over 300 issues, starting in 1931 and the final issue in 1949. In 1937 the Shadow Radio Program debuted. Batman was created by Bob Kane and Bill Finger. He first appeared in Detective Comics#27 (1939.) This means 9 years is the longest that the Shadow would be senior over Batman. Batman hasn’t aged all that much. It is mentioned as well that the Shadow was known to be dead, yet somehow is alive, well, and in the prime of his life! Then all through the story, the Shadow keeps telling Batman that he trained Bruce to take his place as the avenger of evil and Master of Darkness. The Shadow seems to change identities totally on mind power instead of his well-known mastery of disguise. I like the story enough to give it three stars. I really cannot go any higher.